Dr. (Mrs) Obiageli Ezekwesili is a Public Policy Analyst / Senior Economic Advisor, AEDPI and Co-Founder of #BringBackOurGirls Movement, Nigeria as well as the #RedCardMovement. A Chartered Accountant/Consultant. She holds an MA in International Law and Diplomacy, an MA in Public Policy and Administration from the Kennedy School of Government, Harvard University. She is a founding Director of Transparency International. 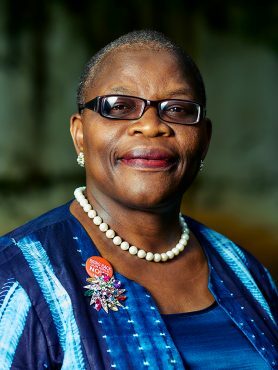 Dr Ezekwesili was Vice President of World Bank (Africa Region) and former Nigerian Minister of Education, Minister of Solid Minerals, head of Budget Monitoring and Price Intelligence Unit as well as Chairperson of NEITI. Dr. Ezekwesili was recognized one of the Time-100 Most Influential People and by New York Times as one of the 25 Women of Impact for 2015. Albert Einstein’s Foundations named her one of 100 visionaries featured in the 3D book « Genius:100 Visions of the Future”. She has received numerous local and international awards and serves on the boards of numerous local and international organizations such as; Ambassador, International IDEA; Independent Director, Board of Bharti Airtel India; Member of Board, Tufts University-Global Leadership Center Boston; International Advisory Board, Tel Aviv University, Hartog School of Public Policy, Tel Aviv, Israel; Central European University-School of Public Policy, Budapest Hungary; Global Board, WWF- Switzerland; Commissioner, Global Ocean Commission – United Kingdom; IC Publications; etc. 2012 Index of Economic Freedom. The Heritage Foundation.